Additional Info: The patient is an elderly woman with new onset watery diarrhea, and a normal-appearing endoscopy. This illness is steroid responsive. 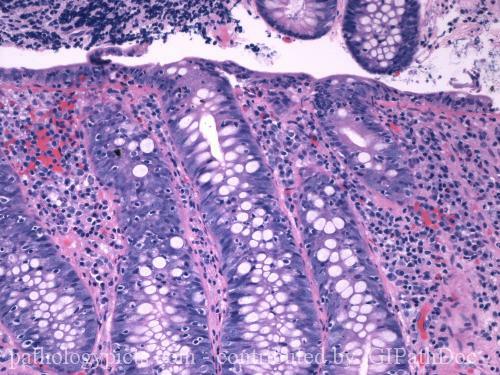 Note that you can occasionally see neutrophils in microscopic colitis (both lymphocytic and collagenous). Neat case. Is it unusual to have this degree of lymphocytic infiltrate without the sub-epithelial collagen band? Also, in the context of BMT, would this appearance suggest GVHD? LOL? OMG. Some authorities believe that lymphocytic colitis and collagenous colitis are indeed simply a part of spectrum of disease with a common underlying pathophysiology. Evidence to support this claim includes patients who have had findings of both collagenous and lymphocytic colitis at different times during their disease. One possibility is that lymphocytic colitis is simply an early form of collagenous colitis. All is not well with this theory, however. For example, HLA-A1 is more common in patients with lymphocytic colitis (76 percent) than in controls or patients with collagenous colitis (26 percent). OK, time for me to GBTW. Strong work, K Youens. We issue the comment about both entities being on a spectrum with our reports. I like it in spite of the HLA data because of the temporal variability within the same patient as you mentioned. Also, there can be regional variability. For example, it is not uncommon for us to see multiple colonic sites biopsied at the same time where some show lymphocytic and some show collagenous changes.